We all thought hover boards would be here by now, so it’s no surprise we are somewhat sceptical when it comes to the arrival of wearable technology. From smart glasses to smart watches, tech companies are working hard to bring innovative wearable designs to the forefront, but will this impact online casino games and will we be able to play them while wearing the wearables? This question can only be answered with time but since there is a lack of real money casino games available for the wearable technology market thus far, we predict it may be a while before we find out exactly the impact it will have. Regardless, we take a look at the current wearable products available, their potential in terms of Internet casino games and how they may stack up against the current online gaming environment. Wearable technology, often called wearables, are electronic devices which can be worn somewhere on the body, such as on the head, eyes, wrist, etc. and are generally wearable versions of smartphones and tablets. Wearables have the potential to do more than these devices, including with the likes of Internet casino games. Wearers are generally able to access emails, social media, and store data, with the addition of some devices performing differently. For example, some products target fitness gurus while others target business users. Wearables are titled accordingly due to the fact they can be put on and taken off, though a potentially creepy concept of smart tattoos have been mentioned but we are hoping this remains as an idea only. Overall, wearable technology has the ability to offer a hands-free mobile option for players and even an immersive experience depending on the device. We take a look at some of the available wearable technology and their potential to change the Internet gaming industry forever. Smart glasses are basically glasses with advanced interfaces due to the computerised device installed. Initial prototypes were just displays which you viewed on the the glasses screen, but innovation and technology has seen the development of smart glasses mimicking smartphones with LCD projection allowing wearers to view and use mobile apps, GPS, and more. While Google Glass and other future smartglasses have been banned from land-based casino venues, we believe it could be a device to play online casino games, though we recommend playing at home since they can be quite distracting. The issue with smartglasses is that while they immerse you in the game, they limit your ability to multi-task which portable devices such as laptops, tablets, and smartphones allow, and is potentially why there are no real money apps available as of yet for the following smartglasses. Google Glass – Google Glass is perhaps the most prominent in the smart glasses industry with the general public eligible to purchase the wearable technology, though production has been ceased. Although app developers for this device seem to lean more towards basic daily functionality such as reading emails and using Google Maps, there has been an app developer, 6beyond, who created a non-real money blackjack app for wearers to play. It’s an interesting concept and if you own a pair of the expensive glasses, it could be a great idea to download in-case real money casino apps are produced for the glasses in the future. Additionally, since wearers can access any website via these glasses, it may be possible to access one of our recommended online casinos via this method and play regular Internet casino games using Google Glass. GlassUp – GlassUp smartglasses aren’t as popular as Google Glass and could be perhaps due to the fact that they are more of a notifying device than a wearable smartphone. The glasses let you know when emails, text messages, social media notifications and more come through; they are only shown for a minute and then they disappear. While this is not handy for playing Internet casino games, it could be a great device to let you know when new promotions are available as well as when new games have been released. With Apple moving it’s focus away from smartglasses and toward smartwatches, the mainstream public have also been steered in that direction. While watches use to just be for telling the time, they have now been developed into a computerised device which initially only allowed wearers to access games, a calculator, and a translator, but have advanced to offer the ability to access mobile apps which smartphones and tablets have. The most advanced smartwatches can see the inclusions of a camera, mobile phone, GPS, speaker, rechargeable battery, and be compatible with a wireless device. There are also the models which have been produced with health in mind featuring a fitness tracker that indicates speed, heart-rate, sleep, and much more. As more and more of these watches are released by differing companies, new features will constantly be added and app developers will begin researching their compatibility with certain markets including playing online blackjack, roulette, poker and more to play with real money via the smartwatch. 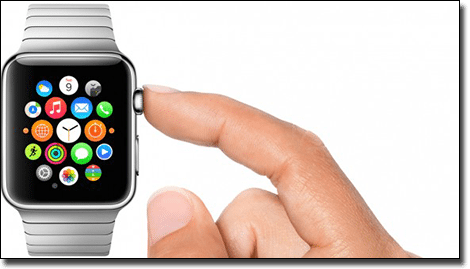 Apple Watch – Apple Watch has been marketed as a personal technology device which claims to be almost like a wearable iPhone. It’s compatible with your iPhone like all Apple devices and wearers can use Siri, answer phone calls, read emails and social media messages without the need for your smartphone or tablet. There is also a sports orientated smartwatch from Apple which means the fitness trackers that are quite popular will probably be soon forgotten. Gambling on smartwatches hasn’t been at the forefront for developers but if we take the time to think what it could mean, there is the chance we could one day be playing live dealer blackjack on our wrists. The possibly of gambling online via the Apple Watch is highly exciting but only time will tell whether it will be a legal possibility for Australian players. Sony Smartwatch – Sony have had a few smartwatches released over the years and they are constantly advancing in terms of what wearers can do on the devices. The Sony Smartwatch is powered by Android so wearers can access apps from Google Play as they would via their smartphones. The screen size and graphics have been somewhat condemned, however. There is a blackjack app available to download to the Sony Smartwatch. Created by Tesseract players, it has been created specifically for the smartwatch so players can practice their blackjack strategies, in practice mode only, when and wherever they like. There is no audio for this game as it isn’t compatible with this smartwatch so this is where smartphones do have an upper hand. Virtual reality headsets definitely sit in the category of unrealistic technology advancements alongside hover boards, but they’re actually on their way, and they might actually be a preferable option when it comes to playing casino games online over smartphones and tablets. VR headsets are a chunkier version of smart glasses, but have more emphasis on gaming as opposed to performing daily activities such as emailing. Using a wearable display, images are projected which even occupy the wearer’s peripheral vision meaning players can be fully immersed into the game they are playing. While there aren’t any real money casino games available just yet, we think they may be in the works as it is focused on gaming as opposed to what the smartwatches and smart glasses are targeted to do. There have been reviews that the current models do cause motion sickness, so this may be one drawback of the virtual-reality sets. The next step for software developers is creating games and online casinos which mimic land-based venues so players can feel as though they are actually stepping to a brick and mortar casino when they put these headsets on. Samsung Gear VR – This virtual headset has won the race in terms of release dates, as it’s already a consumer product, but requires a Samsung Galaxy Note 4 in order to use it. It offers content of 360 degree views with recorded video, which makes you feel like you are flying through Manhattan, or viewing Venice from a gondola, and even swimming with the sharks – which makes for some very interesting and crazy experiences which have been cited to feel incredibly real. There are some basic games available but none which we can enjoy a simulated gambling experience with just yet. Smart rings are less common than the aforementioned devices but they still shouldn’t be ignored. They’re a small ring which fits on your finger that can send emails via bluetooth and alert you when social media notifications come through, which can be read word by word. While we don’t see this being a major platform for online casino games, it could be used in conjunction with another device in a way of a control or even a device which allows you to top up your online casino accounts easier. But we will have to wait and see. When smartphones were first developed they made a huge splash and app developers came out of the woodwork to join forces to grab a market we didn’t even know existed. From here, app developers have continued to create innovative features for our smartphones, and now tablets, including the ability to play casino games such as video poker, slots, table games and more from our portable device. While this was never at the forefront of developer’s minds when smartphones and tablets were released, it has found a prominent share of the market. It did take a while for mobile compatible Internet casinos to be released, but now all of our reputable online casinos offer this type of platform for smartphones and tablets. Wearable technology on the other hand has the problem that it is almost the same thing as what smartphones and tablets are, only we wear it on some part of our body. This means a new market isn’t being created and therefore will not make as big of a splash as smartphones and tablets have. We believe both smartglasses and virtual reality sets actually have the opportunity to change the way we play Internet casino games and even have the ability to challenge land-based venues – provided they implement entertainment and human dealers, which can be quite expensive so it may not be a possibility. Regardless, we believe there are great things to come in terms of wearable technology and Internet casino games. Sign up at SlotsMillion.com to play hundreds of online pokies in VR mode with the site’s official Oculus Rift support.